Markus Hartmann received his diploma in engineering, in 2009, from the University of Applied Sciences Amberg-Weiden, Germany, and his master of engineering, in 2011, from the University of Applied Sciences Coburg, Germany. 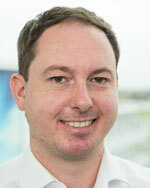 In 2010, he joined Fraunhofer Institute for Integrated Circuits (IIS), where he was a research assistant at the Locating & Communication Systems Department within the RFID and Radio System group. His research focus was on inductive low-frequency localization technologies for a goal line decision system. He is currently working toward the Ph.D. degree at Friedrich-Alexander-University Erlangen-Nürnberg (FAU) in the area of localization based on phase and signal strength informations.